2. We accept debit cards, credit cards (Visa, Mastercard, American Express, and Discover) and cash. All cards must be signed by the owner of the card. 3. When unexpected illness strikes a pet, unexpected expenses strike as well. Rolling Hills Pet Clinic understands this and is able to make some special arrangements through the CareCredit program. You can easily apply online at www.CareCredit.com/apply/ or over the phone at 1.800.677.0718 for immediate approval. 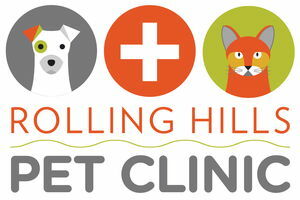 To help meet the needs of our pet parents that may not otherwise qualify for CareCredit, Rolling Hills Pet Clinic offers an interest free payment plan. Monthly payments are automatically deducted from a qualified pet parent’s bank account. Certain restrictions and fees do apply. Download Our Mobile App PetDesk and sign up for our Healthy Paws Crew for Rewards you can use towards your visit. You can also become a VIP Crew Member for DOUBLE the rewards points!